I participated in a campaign on behalf of Mom Central Consulting for Sturm Foods, Inc. I received a promotional item and product samples as a thank you for participating. All thoughts and opinions are my own. Between my husband and myself, we drink a decent amount of coffee in our house. Because our tastes are so different, I usually go for flavored, decaf coffee while he leans toward strong regular coffee, getting a Keurig was pretty essential for us. With what seems like an endless choice of K-Cups available, I sometimes get overwhelmed with which ones to try next. 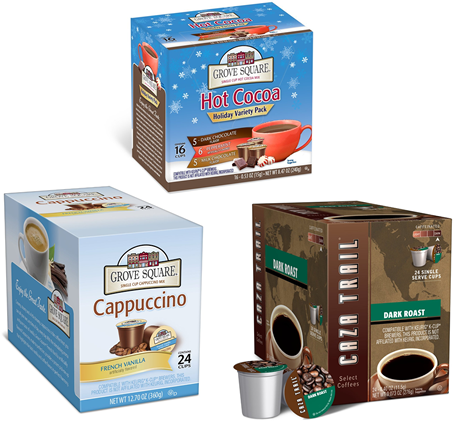 Grove Square and Caza Trail offer a variety of K-Cup coffee blends as well as hot cocoa, hot cider, etc. I received 3 boxes of K-Cups to try out and you wouldn't believe how fast they disappeared. No seriously, my husband had finished almost all of them before I even had a chance to take photos! 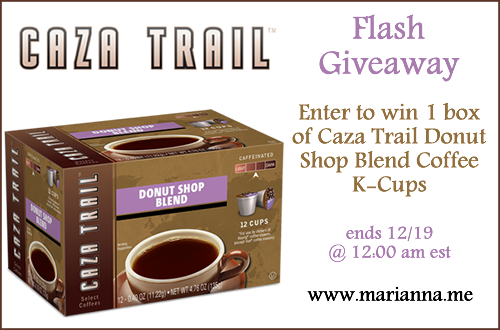 The first to go was the Caza Trail Dark Roast, since regular coffee is his favorite. I let him have them all since dark roast is a bit too strong for me. Instead I went straight for the Grove Square French Vanilla Cappuccino. This was very tasty and was perfect for those rough mornings when I needed caffeine to get me functioning properly. Now that it is freezing out, I love to curl up on the couch with this in my mug and my Kindle in the other hand. Once my husband finished up his dark roast, in literally just a few days, he gave the Cappuccino a try and he loved it as well. This was kind of a shock since he never drinks flavored coffee. But he liked it so much that now I pick it up regularly from our local Wal-Mart. 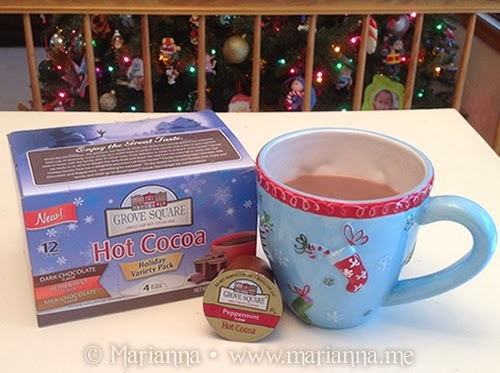 The other huge hit in our house was the Grove Square Hot Cocoa Holiday Variety Pack. Here in Connecticut the winters are pretty darn cold and filled with lots of snow. Neither of which I am overly thrilled about, but my boys sure do love the snow. In the past 7 days we have had two snow days already and after they spend a few hours playing outside, they love to come inside to some hot chocolate. Having it on hand in a K-Cup makes it really easy for me to whip up 4 mugs of it and since my Keurig can make different size drinks, I will use the largest setting and then divide that into 2 cups. We enjoyed the Dark Chocolate and Milk Chocolate flavors a lot. I did find them to be a little too sweet, but adding just a touch of whole milk to each cup balanced it out plus helps cool it off just enough for small mouths. The only flavor we weren't crazy about was the Peppermint - it wasn't bad, but just not our style so to speak. I like to drink coffee in front of my computer checking in with my favorite bloggers! Coffee with a little bit of organic half and half. I love my coffee with creamer and toast! I usually just drink it black. If it is really strong I may add a little cream. My favorite way to drink coffee is black. I like my coffee with a splash of fat free half & half. I like black coffee or with just a tiny bit of half and half. Occasionally I'll drink it with holiday creamer. Thanks for the opportunity to win. I like cream and sugar. My favorite way to drink coffee is seated at the kitchen table, as opposed to in the car as I rush to work. I add some flavored creamers as well.